I am trying to get a better understanding of cosmological distances, in particular the angular diameter distance which I have also seen referred to as angular size distance. What I am looking for is a more detailed explanation of why the angular diameter distance "turns over" in the following graph. Wikipedia states in their article on angular diameter distance that objects beyond a certain redshift have a smaller angular diameter and as such appear larger on the sky. I have searched around and have been unable to find a complete explanation of this behaviour and have only found brief answers which state the expansion of the universe or the size of the universe. I would like if possible for a more detailed explanation as well as the physical significance if any at all of what it means for an object to be at this redshift when they emitted light we are now observing. Thank you for any feedback or and discussion or suggestions where to look. I would also like to include as it may be of some help that I am currently in my final year of undergraduate studies in physics so please do not hold back any details or technicalities! On the one hand an object spans a smaller angle the farther away it is, as expected. On the other hand, due to the expansion of the Universe and the finite speed of light, very distant objects were closer to us when they emitted the light we see today. At that time they spanned a larger angle. The following paragraph is hard to understand without a drawing , so have a look at the drawing in this answer, which may help. The light from the edges of a galaxy that happened to travel toward where we were at the time it was emitted did not reach us, because by the time it arrived to that place, we were no longer there. But the light that happened to be emitted toward some point behind us reached that point at the same time as we did, so that's what we see. 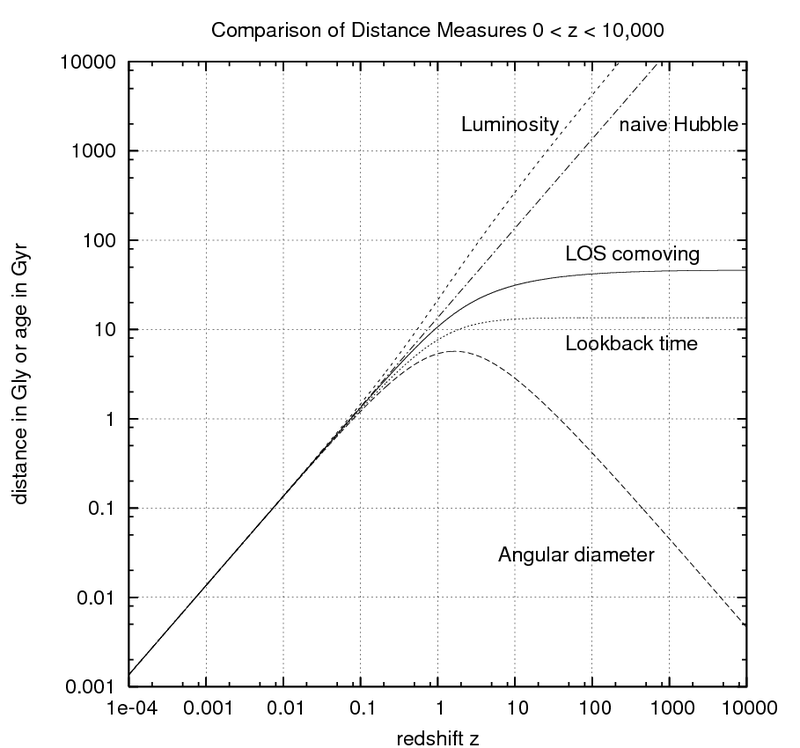 The exact turnover, the threshold between "looking smaller because far away" and "looking larger because closer in the past" depends on the expansion rate history of the Universe, as well as on the way that light propagates in the Universe, which in turn depends on the densities od the various constituents of the Universe. The interrelationship of these quantities is given by the Friedmann equation. Not the answer you're looking for? Browse other questions tagged cosmology distances redshift angular-diameter or ask your own question. Do objects look larger the further away they are, beyond z=1? Could a contracting Universe create the redshift effect observed by Hubble? From what distance would our sun have an angular diameter of 7 arc seconds?